I became a fan of the property generally known as Battle Angel in my teens when I found the 2-episode animated Original Video Animation (OVA) at a rental store. Battle Angel is incredibly important to me––a member of the pantheon of aesthetic and tonal inspirations next to X-Men: God Loves, Man Kills, Highlander, The Road Warrior and Teenage Mutant Ninja Turtles (the gorgeous 1990 live action movie). 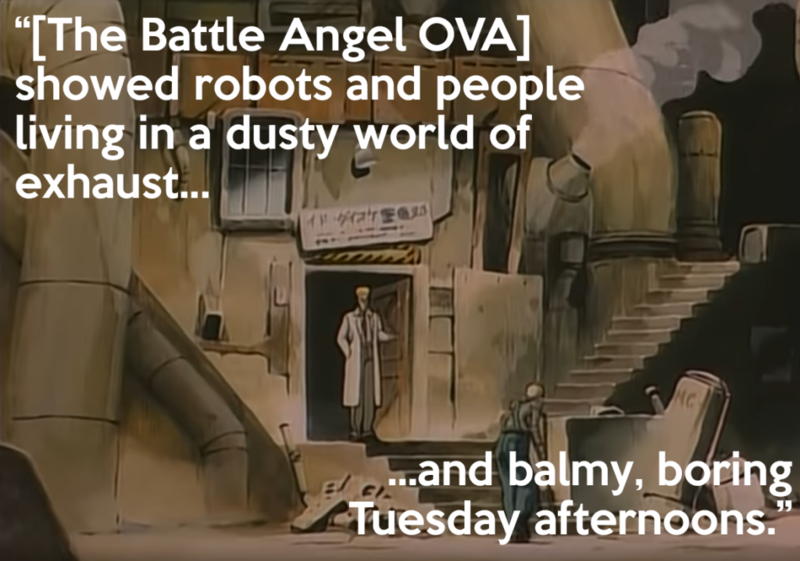 Battle Angel, to me, became my baseline for futuristic science-fiction: a dusty, exhausted cyberpunk future where the downtrodden live a beaten-down life literally underneath––and in the shadow of––the unknown but ever-present “betters” above them. Battle Angel takes place in a nigh-post apocalyptic future United States in a city called the Scrapyard (or Iron City, depending on the medium), a ramshackle patchwork town that surrounds a dump, a pile of detritus dumped onto the community from the city of Zalem, a shining metropolis that actually floats above the Scrapyard. Though I eventually found the original manga afterward––and actually read it years afterward––it was, admittedly, the animated version that really became the definitive version for me. It captured that exhausted defeat that I responded to (similar to what I respond to in the Mad Max series and what I love about The Postman) and showed robots and people living their lives in a dusty world of exhaust and balmy, boring Tuesday afternoons. It felt lived in, I guess, and I liked the story that the environment told, especially because the animated episodes told you next to nothing about the history or the culture of this strange but intriguing world. Director James Cameron bought the rights to Battle Angel years ago, and his argument––which is actually fair––is that he was waiting for technology to catch up with his vision. Finally, in 2019, Alita: Battle Angel was released. In my adulthood, I have become intrigued by the idea of adaptation, and I am happy that we have a big-budget Battle Angel movie that, to me, works pretty well. There are a lot of good choices the movie makes, especially with regard to Alita’s story and how they present it. The biggest surprise, contrary to what Cameron has said in interviews over the years, is that it is clearly more an adaptation of the OVA than of the comic, though interesting bits of both are woven together fairly seamlessly. While realizing this made me quite critical, it also made my ecstatic deep down in my nostalgic core. My biggest gripe (among some other, smaller, narrative ones) is that the thing that I fell in love with––that dusty, exhausted, resigned world––wasn’t there. Everything was too clean. Citizens were too happy or nonchalant about their situation. In the comic and anime, everybody knew they were under the heels of their elitist overseers; in the new movie, people are going to sporting events wearing clean, new jerseys with their faces painted the colors of their favorite teams––a sign of leisure and stability––something that this world did not have in previous versions. As a result, some of the charm of the franchise and story was missing in this movie. All was redeemed, however, by the moment I illustrated above. It’s the moment that hit me hardest when I first watched the anime and got choked up to see in its original form in the manga and was ecstatic to see lovingly and accurately rendered in the new movie. 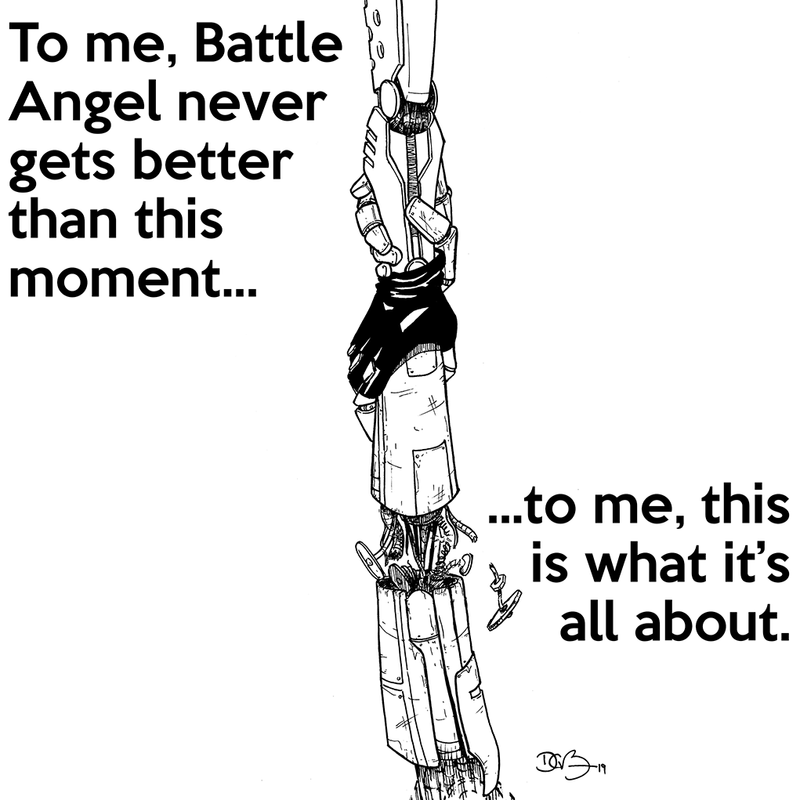 To me, Battle Angel never gets better than this moment. To me, this is what Battle Angel is about: a lone (and lonely) figure that holds onto hope and optimism in a world settled in its self-maintained nest of societal oppression and all are destined to fail. It may not be an ethos I agree with, but it does strike a chord in my core. Maybe it’s the thing I’m consistently fighting against not only with my creative endeavors but with my own self-doubt and anxiety. 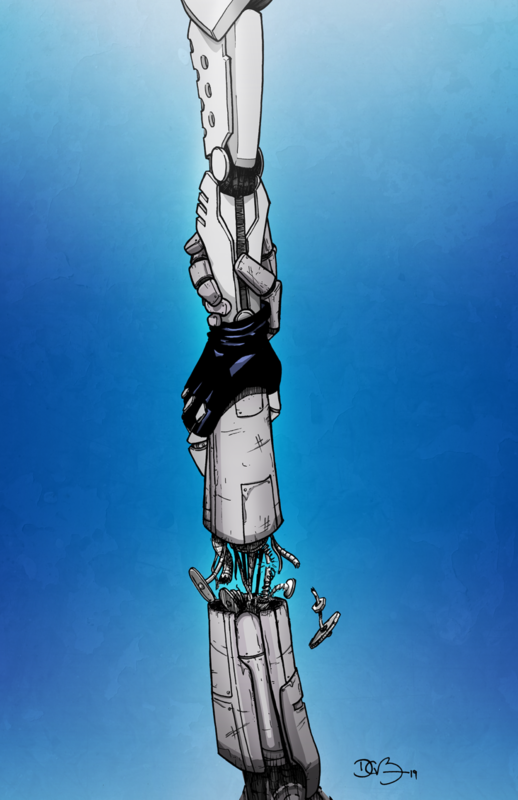 The result of all this being––albeit just a pair of robot hands clutching each other––one of the best drawings I think I’ve ever done. 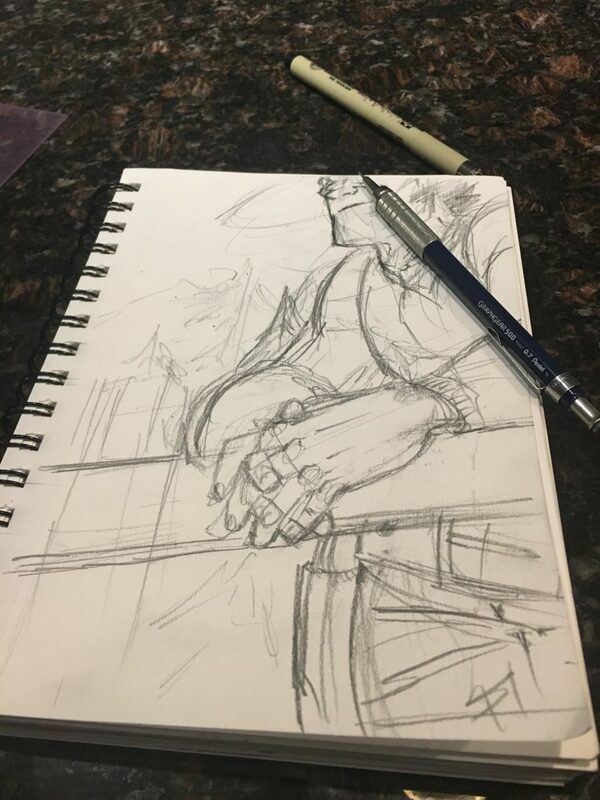 When left to pull from my artistic subconscious––when a blank page sits before me and there’s no story to tell or blocking to figure out for a scene––I have an instinctive pull toward drawing hands. I like drawing hands. I find them to be similar to faces where they can be, at one moment, graceful and, in the next, angular and menacing. They embody the gradient of human interaction, as well. To some our hands give comfort and solace, to others they dole violence and might. Hand close-ups from the third comic I ever posted online. from Eben07 “Operation: Goofinger” by Eben Burgoon and D. Bethel (2007). In the third comic I ever drew (during my previous series), the first two panels were close-ups of hands. That go-to became a visual refrain (some may call it a crutch) throughout that series and is one which has continued through Long John without fail and completely unintentionally. However, hands are our main physical connections to other people––friend, family, and foe. They are the original modes of discourse and, for some reason, they fascinate me. 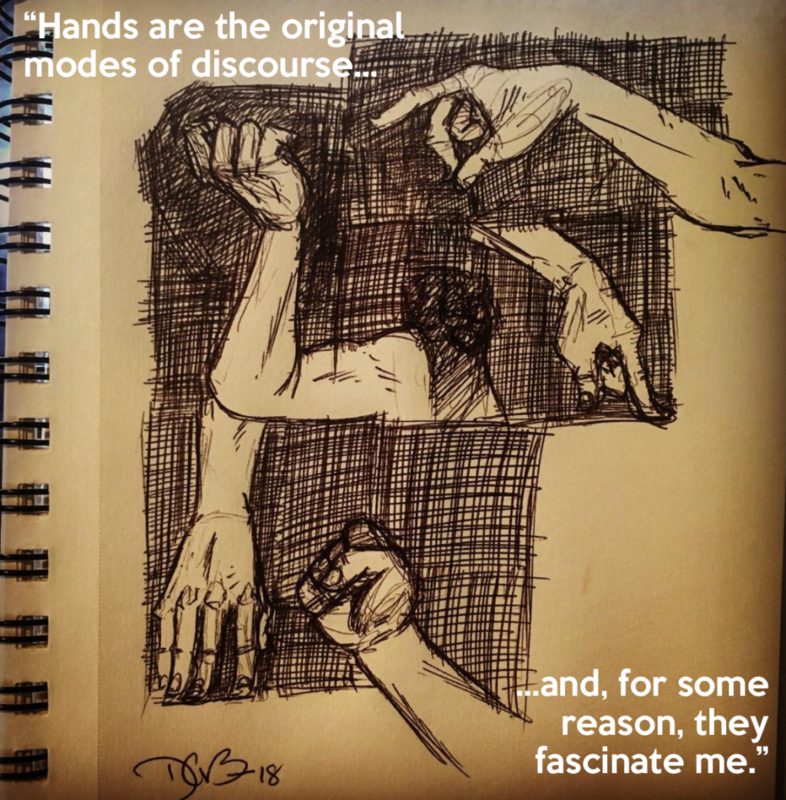 Outside of drawing comics, the fascination perpetuates through my art as the three most popular drawings I have posted online are hand-focused as well. Without knowing it, my own predilection for drawing hands has created an accidental series of images––all homages/fan art––that, now that I’m aware of it, shows me a road I should continue down if digital thumbs-ups and illuminated hearts are to be believed. D. Bethel’s most popular images online (aside from pictures of his dog) are fan art featuring hands. L-R: Crimson Peak, Logan, Battle Angel. I stay away from making (and especially selling) fan art for a variety of reasons. The big reason is artistic; yes, I have a style, but when I’m drawing characters I love from stories that mean a lot to me, I feel an urge toward faithful recreation and the result ends up looking like art drawn by a guy trying to not draw in his own style. By simply focusing on hands, I can retain my own artistic sensibilities while also being more expressive with the end result. To me, this is better than if I were attempting to draw the faces and poses for these characters, knowing that they don’t look like how I think they should look (because that ideal is defined by the styles of other, better artists in my head), forever an echo of what they actually are. And when it comes to art from a completely different culture, such as manga and anime (where Battle Angel Alita/Battle Angel/Gunnm comes from), the mere attempt to draw those characters seems like I’m committing an act of appropriation (and me alone; I have no problem with people drawing their favorite characters). But I have that reaction to any fan art I think I want to do. Time after time, it involves close-ups of hands. Random doodles while hanging out at a brewery last August. Nothing but hands. I will say, however, that the Crimson Peak drawing that started all of this was an idea suggested by my wife. I had the idea of one of the characters dancing with the main ghost haunting the movie (which has narrative significance, no spoilers) and, as I was fretting over angles and poses, she said to try drawing just the hands since that was the most important and interesting part anyway. As soon as she said to zoom in on the hands, it all clicked into place. I guess, subconsciously, that realization opened a door that I all to often just walked by and––especially lately––I feel much more free and open to drawing anything now that I know I have a grasp on a method that results in something that looks like a D. Bethel drawing and not simply an imitator. It’s not because it’s easy to draw––hands are not easy to draw––it’s just that their language is clearer to me than trying to create an entire scene or character pinup, though those would undoubtedly sell better. In a lot of ways, I’m a bad X-Men fan. When I entered the world of Marvel’s mutants, action and power poses were the narrative language and, while character drama and interaction were there in the early nineties, I would find that such scenes were much less important from what they once had been. 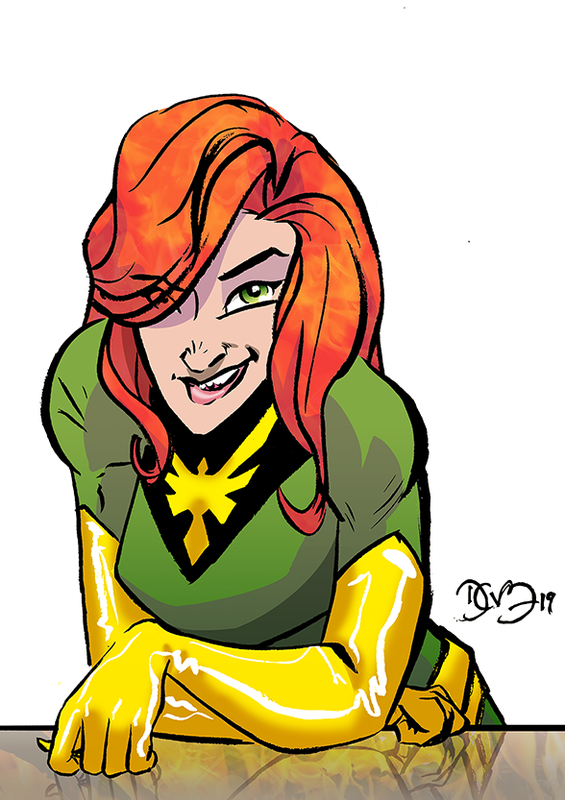 The character of Jean Grey aka Marvel Girl aka Phoenix aka Dark Phoenix is one of what fans call the O5, meaning the original five characters introduced with X-Men #1 in 1963 by Stan Lee and Jack Kirby. Along with Scott Summers (Cyclops), Warren Worthington III (Angel), Hank McCoy (Beast), and Bobby Drake (Iceman), Jean Grey joined the team in the first issue to become “the girl” among the team of super-powered boys and, during that initial run, assumed the role many female superheroes assumed: the member of the team who got captured, needed saving, feinted from the horror of the events, the one who was sequestered to protect her from the evils of the world. In the seventies, the book was reinvigorated (and saved from ostensible cancellation) by a writer who cared equally for all of the characters. Though the roster of the X-Men had grown by the time writer Chris Claremont joined, he turned up the soap opera dial and mixed it admirably with the superheroics to turn the floundering book into something the public hadn’t seen before. And it worked. Jean Grey was one of the first (the first?) 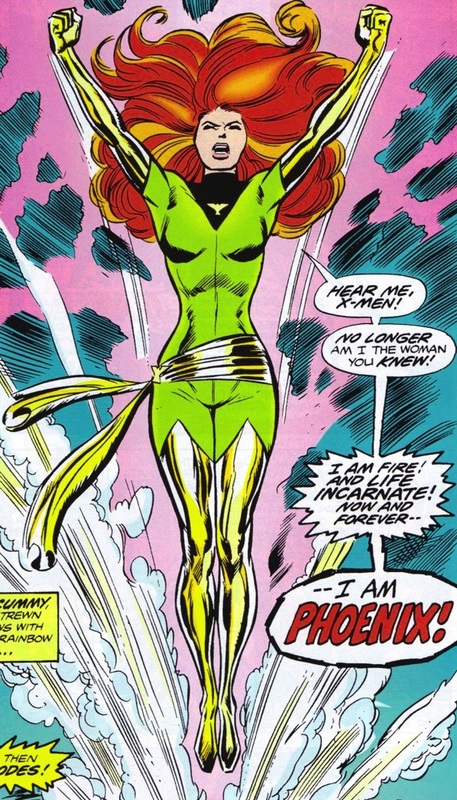 major superhero deaths in comics, after being corrupted by a Lovecraftian cosmic entity known as the Phoenix Force which amplified Jean’s nascent superpowers to the level of godlike manipulation of matter, Jean consumed an entire star system, including a world inhabited by a sentient species. Amid the guilt, she sacrificed herself as penance for her crimes and triggered an automated laser cannon that vaporized her, wiping her from existence. Of course she came back and with her return six years later came retroactive continuity and a bunch of new drama. By the time I met her in X-Men (volume 2) #1 in 1991, the trend of comics pushed her again to the sidelines and her role was ostensibly that of housebound motherly confidant and girlfriend to the boy scout hero of the team (echoing in some ways the role of Deanna Troi in Star Trek: The Next Generation) which was only confirmed by the popular (but, for me, disappointing) X-Men: The Animated Series. So, early in my comic reading days, I dismissed her for the more prominent and forward-leaning roles of characters like Rogue or Psylocke. Compared to them, Jean was boring. As it turns out, Jean was pretty rad. From Uncanny X-Men #101 by Chris Claremont, Dave Cockrum, Frank Chiaramonte, and Bonnie Wilford. But I heard a lot about something called “The Dark Phoenix Saga” and how Jean turned bad and how it was a story built with layers of theme and complexity of characters, Jean most of all. Hearing this, I wrote it off as nostalgia-bound argumentation because it so contrasted with the Jean I knew. Needless to say, Jean Grey may not still be my favorite character, but of pretty much all the X-characters I always sit up when she enters a story because she still, after almost fifty-six years of existence, brims with narrative possibility, as if waiting to once again show us all how it’s done to be one of the most powerful, interesting, and dynamic characters in a superhero story bar none. That aside, since she has often been the focal point of high melodrama––and continuing a bit of the artistic themes established by the two Long John-based drawings from the last two weeks––I am motivated by the idea of seeing these characters who lead with their fists and fury to sit around and crack a smile. If anything, I feel like they deserve it, Jean more than any one else. 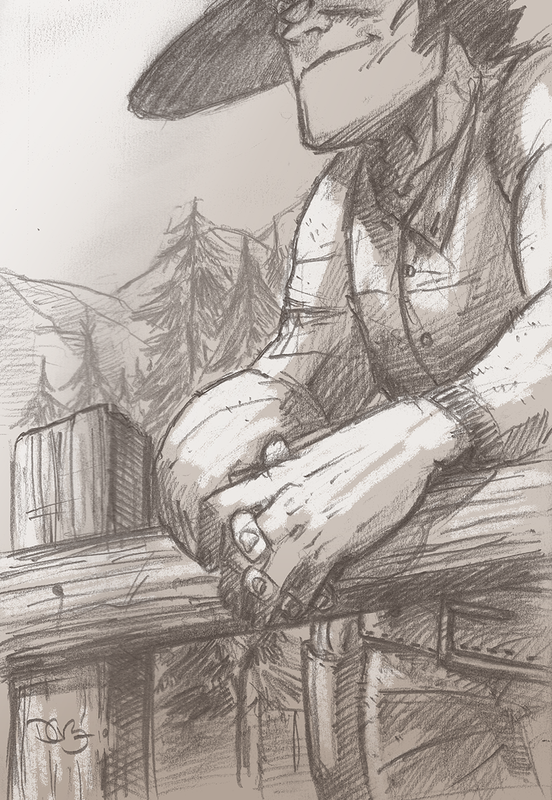 I’ve been enjoying drawing these characters in repose, given a chance to relax where they otherwise will not have the opportunity in the book. I’ve been joking (to myself) that I spend enough time drawing people looking serious and sullen that an actual challenge would be to try and draw them chilling out. The embedded, contextual narrative I had playing through my head (I’m talking like it’s just headcanon when––as a friend once pointed out to me–– in reference to these characters, it’s actually canon) for the drawing of Jonny was that he was laughing at a bad joke that Juan John was telling, or in the middle of a good-natured barb in response to a bad joke. Working out this week’s drawing. It’s actually these moments that are most fun to draw, for me. Part of that joy is technical––it’s when people are relaxing that poses get interesting. When reclining sideways on a chair, it challenges the artist to really consider weight and volume and the play between them. On the other side, such drawing is great to really suss out the character. Most stories do feature––as mentioned earlier––characters during their most stressed out or somber, but that’s because of what stories are––the events that occur to disturb the norm. The stories we tell of our lives are the moments that our routine is broken that something good, bad, or strange happens to us and we show ourselves in that moment which is often in a heightened state of emotion. But life actually happens between those stories and it’s those moments we go to when we define ourselves. Despite the fact that my job is to literally stand in front of a room of people all day and talk to them, when I create a mental image of who I am, I think of when I’m alone in my office typing or drawing and talking to absolutely no one. It’s in these private, exposed moments that a creator can more fully define who this character actually is because it’s those moments we are always fighting to get back to.